In the Republic of Uzbekistan, on August 29th, 1997 the Law «On Education» of the Republic of Uzbekistan and «National program for personnel training» were adoptedon the purpose of upgrading the level of educational sphere up to the worldstandard.According to these acts, since 1999in the Republic of Uzbekistan, in a number of leading higher educational institutions the second level of training – a magistracy has been opened where preparation of personnel started. Since then, master degree studies on definite specialties have been arranged along the relevant faculties ofthe university. Since 2001, special magistracy faculty have been opened and it was supervised by leading professor teachers (professor S. Kosbergenov in 2001-2004, professor Sh. Abdinazimov in 2004-2005 years). The magistracy faculty was turned into special department in order to enhance the master degree specialities and boost the scientific potential in this direction. At the head of this department were professors M. Tagaev (2007-2009years) and E. Kutibaev (2010-2012years). During the past years, opportunities were created in order to provide with personnel in the scientific pedagogical sphere. While 2017-2018 academic year undergraduates were accepted to study to Master Department in 22 specialities, since 2018-2019 experienced professor teachers have been sharing knowledge with graduates in 24 specialities. Nowadays, the department is supervised by the candidate of jurisprudence associate professor Amanlik Gulimov. 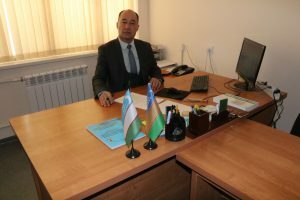 Methodologist Begis Boranbaev is engaged with organizational and academic work of the department. Graduate students who study and carry out research work at the department have achieved significant success in the scientific areas. In addition to this, graduates also take active part in the social life of the university. For example, in 2008-2009 academic year graduates of magistracy department took part in the competition «The best master’s thesis» that was held in Tashkent city. As a result, five graduates’ works were awarded first place. Accepting talented youth and students who has capability and interest in science for the master degree studies on the grounds of transparent and fair selection gives its productive results. Talented graduates with their achievements in academic life, science, culture and sports are pride of our university. Kutlimuratov Anvar, Matkarimova Sarbinoz, Toreshova Sarbinaz, Ahmedova Zulkhumor, Reimbaeva Zukhra, Kurbanbaeva Nasiba were awarded grants named after Berdakh and became the winners of the competition «Ihtidorli talabalar».They are our pride. The socio-economic development of every country is defined by its intellectual potential to significant extent. The state with scientific potential is recognized by the world leading countries. So, the professors, educators do their best and put much effort in this direction.